In your garden, perhaps, a dandelion may be a weed, but you remember that feeling as a child when you blew across one to make a wish…. You can capture that sweet, breezy feeling on your wall with our Flying Wishes vinyl wall art and stickers. It’s simple, bold and natural, yet modern, and it adds a playful, wistful touch to any wall. It could adorn your living room as well as it could a bedroom or guest room; anywhere you’d like to add a new decorative highlight. You have many options, as well, with this idea. This one is called Catching the Breeze, but we also have Dandelion on a Breeze and Ready to Blow. You can mix and match to create a beautiful theme and since each is available in black or white, they’ll complement many styles of décor, from ultra modern to shabby chic. See these and others in our Floral & Grasses section. 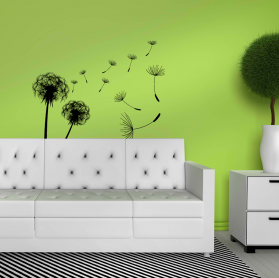 Like each of our vinyl wall art designs, they come in several sizes to fit the spot you want to catch the eye and these bold designs can be placed against a plain white wall for a stark relief or a bright colored wall for eye-catching contrast. Your imagination can flow as free as the breeze that inspires this great look. They’re easy to apply – no messy glues or fixers – and they’ll stay sharp and crisp for years, without peeling up at the edges. You can also move them when you want to try a new look without leaving sticky residue on the wall. They’ll always give the appearance of having just been painted on the wall, but without the cost and heartache of trying to paint something so lovely and eye-catching yourself or paying someone to do it for you. To learn more, please contact us at [email protected] or go to our Contact Us page for more ways to get in touch.